With only one and a half more days till the weekend, we are counting down the hours until we can embrace the sunshine (weather reports indicate it’s going to be pretty warm!). What do you have planned for this beautiful weekend? If the answer is “nothing,” we’re here to help. Here is an Inland Empire weekend update that will surely keep you busy having fun! Garden workshops cover a variety of topics including growing fruits and vegetables, harvesting, pruning, composting, and more! Workshops are normally held at the Chino Community Garden, N/E corner of 5th and D Streets. Workshops are presented by the City of Chino’s Healthy Chino and Green Chino Initiatives in partnership with the UCCE Master Gardeners of San Bernardino County, Kaiser Permanente and 4th District Supervisor Curt Hagman. Parents/guardians are encouraged to bring their children to participate in the Children’s Discovery Workshop, taking place during the garden workshops. For more information on Children’s Discovery Workshops, visit discovery.healthychino.com. Free Admission. Advance registration is encouraged. Space is limited. For more information, please contact (909) 334-3478, healthychino@cityofchino.org, or visit healthychino.eventbrite.com. Participants will learn basic information about efficient irrigation systems, soils, design practices, fertilizers, and water wise plants. At Children’s Discovery Workshops, participants learn about nutrition, gardening, and the environment through fun, interactive activities and crafts. Themes vary monthly. The workshops also provide a fun and safe atmosphere for children to socialize and make new friends. Workshops are normally held at the Chino Community Garden, N/E corner of 5th and D Streets. Garden workshops are offered to adults and parents/guardians during the Children’s Discovery Workshops. Learn more. Participants will learn about where their water comes from, what the water cycle is and its connection to our water supply, and how to use water more efficiently. Participants will also make a craft to take home. Pat Macha regularly speaks on the topics of aviation accident history, archaeology, and safety. His programs feature PowerPoint presentations and graphics. Pat will give a presentation for 30 minutes then sign and sell his books.With 52 years of research and field experience in aircraft wreck research, Pat Macha has authored five books on aircraft accidents in California: “Wrecks in the Mountains & Deserts of California 1908-1990”, “Wrecks in the Mountains & Deserts of California 1909-1996”, “Aircraft Wrecks in the Mountains & Deserts of California 1909-2002”, “Historic Aircraft Wrecks of San Bernardino County” (This is the latest book in the excellent aircraft archaeology series by author Pat Macha. In it he tells the stories of over 425 aircraft wrecks that have occurred in California’s San Bernardino County (east of Los Angeles). This area is the largest county in the lower 48 states, and stretches from barren deserts to towering mountain peaks. It is also the home of many past and present military bases and test ranges. Because of these factors, this area has been a fertile ground for aircraft accidents, and this book tells the story of many of them.) Pat has been documenting crash sites throughout California in remote locations for fifty-two years, leading him to over 150 crash sites in Los Angeles County. See his site at Aircraftwrecks.com. Pat has assisted the Project Remembrance Team by helping next of kin in visiting crash sites of their loved ones. Pat’s field work and research travel includes: Alaska, Arizona, California, Colorado, Hawaii, Maine, Nevada, New Hampshire, New Mexico, Oregon, Utah, Vermont, Washington, Canada, Mexico, Russia, Switzerland, and the United Kingdom. Featured in many newspaper and magazine articles; also in television on the History Channel program “Broken Wings”. Pat has had scores of speaking engagements. He is a graduate of Azusa Pacific University and California State University at Long Beach. 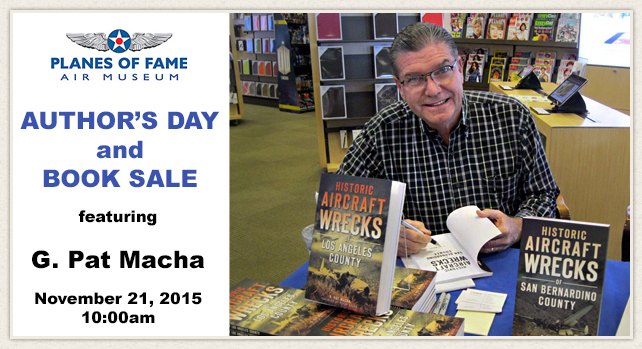 In addition to our speaker, our Research Library will have it annual book sale, selling fascinating books on aviation. Ev ery Sunday Priceless Pets hosts a Pack Walk/Hike to get all of the dogs out of The Orphanage. Don’t miss out on this fun chance to interact with a variety of rescue dogs, while also getting some exercise in! The City of Claremont is preparing for heavy rains and possible flooding this winter because of El Niño weather patterns. To assist residents in preparing for storms, the City has cleared storm drains, evaluated potential flood areas, ordered equipment, and trained employees in emergency response. It is important that the City, Residents and Businesses work together to be as prepared as possible for an El Niño storm. While the City strives to protect City facilities, Residents and Businesses can prepare by doing a few simple steps. • Evaluate Flood Insurance options. • Obtain sandbags ahead of time. • Clear rain gutters and drains. • Have an emergency plan. • Water and food on hand to supply your family for at least a 72-hour period. • Monitor media outlets for information on weather conditions and flooding. • Replace tires and windshild wiper blades on cars if needed. • Avoid areas subject to sudden flooding. • Stay back from rushing water and do not walk through flooded areas. • If you come upon a flowing stream where water is above your ankles, STOP! Turn around and go another way. • Stay away from downed power lines and electrical wires. Electric current passes easily through water. • Monitor media outlets such as radio, television, and the Internet for information concerning weather conditions and flooding in your area. • If the waters start to rise inside your house before you have evacuated, retreat to the second floor. • Take dry or waterproof clothing if possible, a flashlight, and a portable radio with you. Then, wait for help. • If you are stranded and surrounded by water, do not swim to safety; wait for rescuers to come to you. • Look out for animals – especially snakes. • Check your home or business for water damage. • Inspect and clean rain gutters and drains. • Inspect sandbag locations and condition. Replace as needed. Just Plain Dancin’, a local dance studio in Corona, is hosting their 2nd Annual Christmas Boutique on Saturday, November 21 from 10 a.m. to 3 p.m. at 2451 Pomona Road. The event is a fundraiser for the Circle of Hope Dancers Foundation which supports dancers with cancer. The boutique will feature over 30 booths, a vendor raffle, food trucks, and more fun! 6 p.m. to 8 p.m. – Photos wilt Santa will be available. At 5 p.m. the Tree Lighting ceremony will commence and Santa will arrive. For more info visit their website. *Dos Lagos also has both a Classic Christmas movie series and Family Film series featuring popular holiday films. Famed guitarist Peter White delivers an all-star lineup in A Peter White Christmas featuring smooth jazz trumpet player, Rick Braun and Grammy nominated saxophonist and vocalist, Mindi Abair. Always finding unique ways to bring his modern sensibilities to cherished pop classics, Peter White’s seasonal renditions are sure to captivate. Join us for an unforgettable evening of dazzling arrangements of holiday favorites! Saturday, November 21, 2015 at the Lewis Family Playhouse. Tickets for Gold Level Seating are priced at $60.00 for General and $58.00 for Senior. All Platinum Level Seating are priced at $65.00 and are available online at www.lewisfamilyplayhouse.com or through the Box Office at (909) 477-2752. So you think you’ve got game? Read, learn, and play during International Games Day at your library, sponsored by the American Library Association. Bring your family, bring your friends, and we will all celebrate our love of video and board games, like Apples to Apples, Pictureka, Guitar Hero, Mario Kart, and of course, Minecraft! International Games Day 2015 takes place on Saturday, November 21st from 1 p.m. to 3 p.m. at Carnegie Culture Center. For more information, please contact the Youth Services Desk at (909) 931-4213. Will you be partaking in any of these activities? Did we miss something? Let us know in the comments below!